Yesterday I commented on how corporate managers tend to move on to new, more fashionable approaches, independent of the value of current ones. I played around with using models from religious studies for understanding rivalry in Systems Thinking. Several good books interpret the rapid rise and decline of management initiatives and business improvement methods from the perspective of management-as-fashion. As with yesterday’s topic I think the metaphor of business mindset as religion also helps understand the phenomenon. In the spirit of multidisciplinary study, I’ll kick this around a bit. The fad nature of strategic management initiatives and business process improvement methodologies has been studied in depth over the past two decades. Managers rapidly acquire strong interest in a new approach to improvements in productivity or competitiveness and embrace the methodology with enthusiasm and commitment. The recent explosion of tech/business hype on the web, consumed by small business as well as large, seems to increase frequency and amplitude of business fashions. Often before metrics can be established to assess effectiveness, enthusiasm declines and the team becomes restless. Eyes wander and someone hears of new, even-stronger magic. Another cycle begins – and is exploited by high-priced consultants ready to help you deploy the next big thing. Cameron and Quinn, in Diagnosing and Changing Organizational Culture give a truly dismal report card to nearly all organizational change initiatives. Each successive cycle increases the potential for cynicism and resentment, particularly for those not at the top. 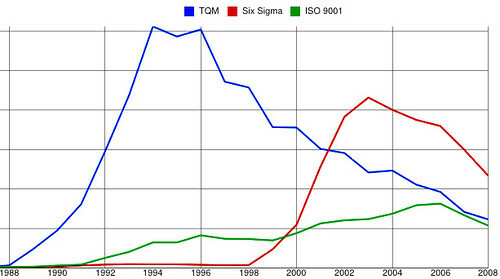 Barry Staw and Lisa Epstein of UC Berkeley showed a decade ago that bandwagon application of the TQMS (Total Quality Management System) initiative in the 1990s did not correlate with increased profits, but correlated very well with decline of employee morale and increases in CEO compensation. Quite a few top managers were highly rewarded for spearheading TQM but retired with honors before TQM’s effect (or lack of it) was known. Having been a consultant in those days, I was painfully aware of what the TQMS and ISO 9001 fads had done for how consultants were viewed by hard-working employees. The last data I’ve seen on use of consultants in strategic initiatives (Peter Wood, 2002) showed that most firms used outsiders to justify and implement such programs. In the management-fashion metaphor, consultants are both the key fashion suppliers and its advertisers, skilled at detecting and exploiting burgeoning sales opportunities. Three of these stand out – Statistical Process Control and DFMA, because, in their most technical interpretation at least, they produced measurable results; and TQMS, because it was embraced with unparalleled gusto but flopped miserably. Despite the negative views of these initiatives in the ranks, I have little reason to find fault with them; they may have all been successful in due time with due commitment. In general, it was the initiatives’ frequency that demoralized, much more than the content. Today’s business fads are less intrusive and less about the organization. But that could change. As a religious parallel, I’m interested in the way ancient religions grew tired of their gods and invented new, oddly equivalent ones to replace them. At some point the Egyptians seemed to feel that Amun-Ra’s power had faded, though he had replaced the withered Nun. Isis and Osiris took Amun-Ra’s place. In the Greek world Asclepius and Hercules/Melkart replaced the Olympian gods. In Rome Mithras replaced Helios, both solar deities. Divine succession may have something to do with the eventual realization that the gods failed to do man’s bidding. The ancients were perhaps a bit more patient than modern business is. In the 1990s, corporate messianic expectation surged. Religious parallels abound in the TQM literature, e.g., Robert J Bird’s observations on Transitory Collective Beliefs and the Dynamics of TQM Consulting, in which he quotes a Business Forum article stating that TQM “will change our lives as much as the advent of mass production”. The long, slow route of continuous improvement wasn’t yielding fast enough. Leaders looked to consulting firms in the sky to deliver immediate bottom line salvation. When it didn’t materialize, a new generation of humbler, more earthly gods emerged. Agile, Scrum, Targeted Innovation, and the seven habits of highly effective business secularists. Closely related to messianic expectation is the concept of sacred scapegoats (see René Girard and Raymund Schwager). In ancient times, when a tribe grew impatient with their king or priest, they threw him into a sacrificial pit, imagining that his sins, their sins, and the current bad times would go along for the ride. A new king was chosen and hopes for renewal were celebrated. Our New Year’s Eve parties retain a hint of this motif. Kings got wise to this risk and introduced the practice of delegating a mock king for a day, selecting some hapless victim/king from the prison. The mock king was both venerated and condemned, then went down the well with the collective sins of the tribe. The real king survived to usher in the new year. Applying this model to continuous improvement dynamics, it may be that there’s more than mere fashion to the speed with which we replace business methodologies. Their adoption and dismissal might simply be part of a stable process of coming to terms with unrealized goals, unreasonable as they might have been in the first place, and throwing them down the pit.